Cutaneous T-cell lymphomas (CTCLs) are a group of extranodal non-Hodgkin’s lymphomas (NHLs) that present primarily in the skin. The most common type of CTCLs, mycosis fungoides (MF) and Sézary Syndrome (SS), were first described over two centuries ago, and since that time, the clinical characteristics, pathophysiology, and immunobiology have been characterized in detail. Derived from skin-homing, mature, effector T-cells that usually express CLA/CD4/CCR4/CCR10 and lack T-cell markers CD7 and/or CD26, the malignant MF/SS cells typically have a Th2 phenotype. With more advanced disease, Th2 cytokines predominate and result in decreased host cell-mediated immunity that likely contributes to increased susceptibility to infection and disease progression. 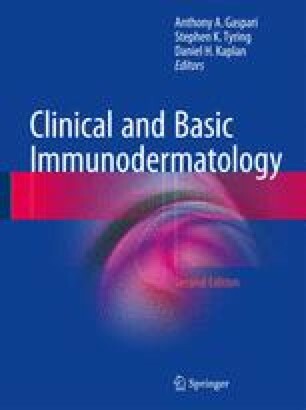 Early aggressive systemic chemotherapy has not been shown to improve overall survival in MF/SS and over the past 40 years  the therapeutic approach has undergone a paradigm shift, such that skin-directed therapies (SDTs) and systemic immune-modifying biologics play a central role in initial MF/SS management. This chapter will review MF/SS clinical presentation, staging work-up, pathophysiology, immunobiology, and how these have shaped current treatment strategies. In particular, MF/SS chemokine biology, immune defects, and immune modifying therapies, including the new frontier of hematopoietic stem cell transplantation will be specifically highlighted. Question 2: Advanced MF/SS patients are at increased risk for which infections?